Location: 17th Street between Missouri and Texas (at the bottom of Potrero Hill). About 1.3 miles east of Mission Street. Our doors open at 8:30pm, unless otherwise noted (check our calendar for specific times) and the bar closes a tad before 2AM. 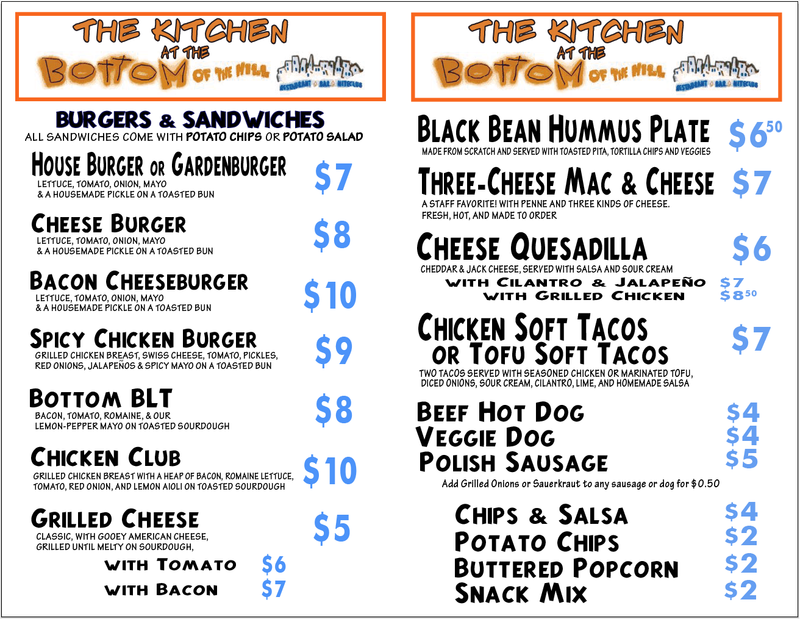 The kitchen is open from when doors open and stays open til late (until around 11pm or after midnight, even). 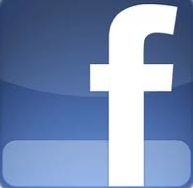 Click to see our current menu. And here are some of our old menus from years back. All advance tickets purchased online are Will Call only. No actual tickets are mailed. 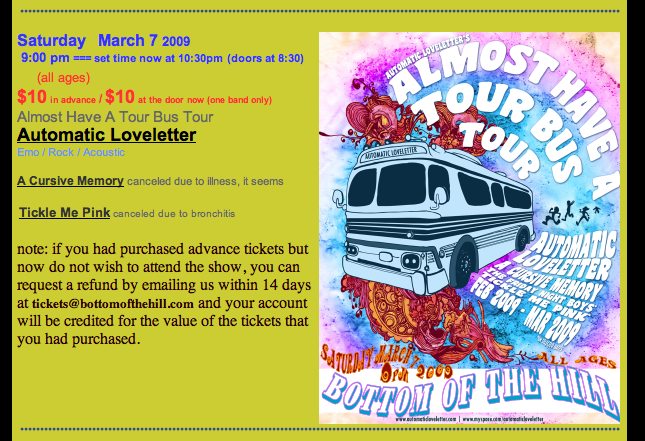 You can purchase advance tickets online by clicking the button or visiting our calendar page or http://www.bottomofthehill.com/calendar.html, or you can generally also just buy tickets to a show at the door on the night of that show when doors open, which is usually at 8:30pm unless otherwise noted. You can check the listings in our calendar for exact times. Note: Unless expressly indicated, the Bottom of the Hill is a "21 and over" club. If it is a "21 & over show", you need to be at least 21 years of age to gain admittance to the club. 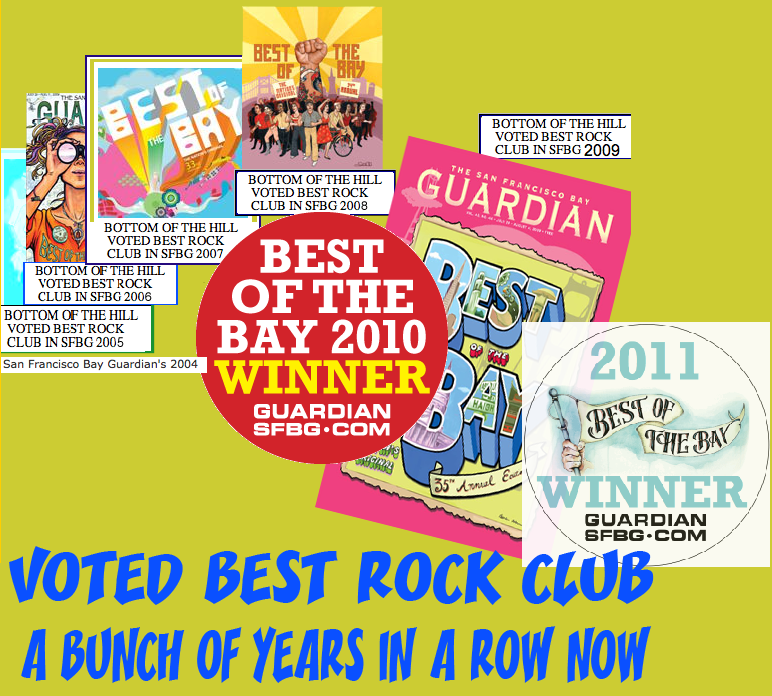 You can check the listings in our calendar to see what shows are over 21, and what shows are not. You need to present a valid government-issued photo I.D. to our door staff to gain admittance. 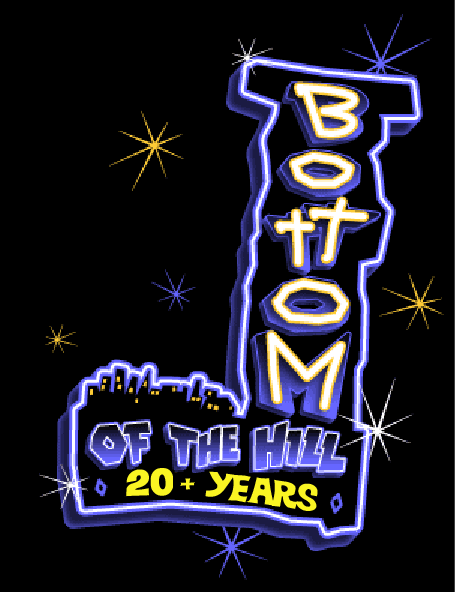 If you have questions about booking you may contact us through email at booking@bottomofthehill.com, but check out our booking webpage first. 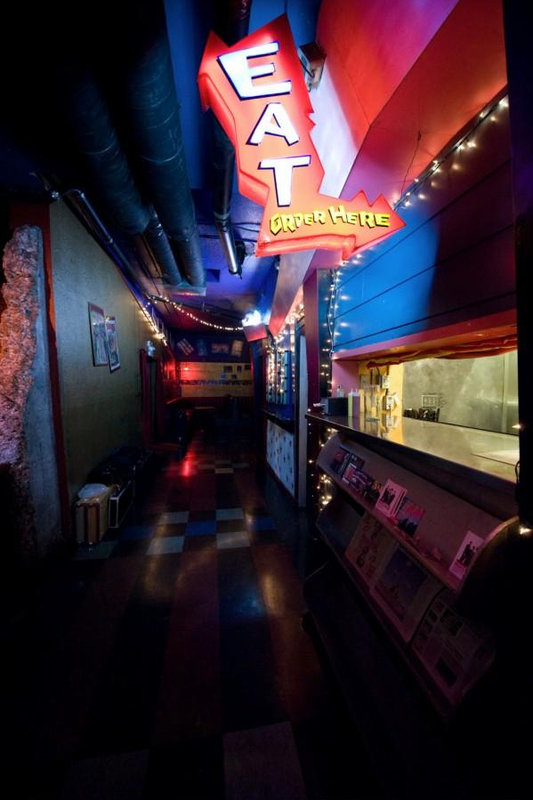 If you have questions about renting the Bottom of the Hill for a private function you may contact us through email at email@bottomofthehill.com. Take the Bay Bridge into SF. Exit at Fifth Street. Veer left onto Harrison Street. Take Harrison all the way to 17th Street. Go left on 17th. 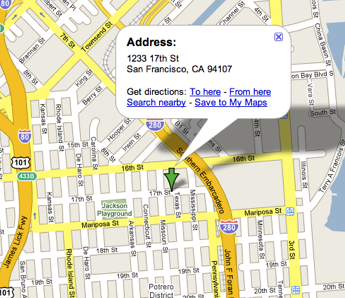 Travel about 1 mile to 1233 17th Street. Take the Golden Gate Bridge into SF. Take the Lombard Street exit. Stay on Lombard until you reach Van Ness Avenue. Make a right on Van Ness. Travel south on Van Ness and cross Market Street. Go about 2 blocks and veer right onto South Van Ness Avenue. Take South Van Ness to 17th Street. Go left on 17th. Travel about 1 mile to 1233 17th Street. Enter SF. Take the Vermont Street exit. (Vermont is the first exit after Army Street.) Go left on Vermont. Go 1 block to 17th Street. Go right on 17th. Travel about 3/4 of a mile to 1233 17th Street. Stay on 280 and follow the signs towards "Downtown San Francisco." Take the Mariposa Street exit. Turn left onto Mariposa at the bottom of the off-ramp. Go 3 blocks to Missouri Street and make a right. Go 1 block to 17th Street and turn right. You are here. Exit at 16th/Mission Station and take the #22 FILLMORE bus line east to 17th & Connecticut.